Another volatile week pulled stock markets down, only to see them rebound strongly by the end of the week. What’s next? As we pointed out last week, the market is at a high risk point. That is still the case here. Last week’s drop has set important lows. If these lows get broken to the downside, then we are very likely to get a bigger drop. Thursday’s low tested the long term up trend support line. The market rebounded very strongly and climbed right back to the July highs. We can expect some resistance at this point. A second test of the 4400 level is easily possible, but not a given. Technically my indicators are coming close to bottoming, with the faster Earl (blue line) tentatively turning up already. The slower Earl2 (orange line) will need a bit more time to turn up. We remain in a lunar red period, favoring more weakness in stocks. I think the next week will be sideways to down, looking for direction. Longer term I would just wait and watch what happens first: a break out to new highs or a drop below 4320. With this kind of setup I prefer to stand aside. The downside risk is still high, while the upside potential is limited by the resistance level formed by recent highs. In the market there is always enough money to be made by going along with what happens. We can try to estimate odds for a given move, or attempt to predict what will happen, but at the end of the day it is our going along *with* the market that makes the money, while trying to fight the market usually costs money. The desire to make forecasts, and the ego that comes with it, is what tends to get (and keep) us into fighting the market. An expensive hobby. Humbly going along with the moves that come is not very ego-fulfilling and that’s why it is a difficult thing to do. Expected weakness in the beginning of September panned out as sideways action, but expected strength after the 20th failed quickly. The market embarked on a serious decline and printed a low on October 2nd. 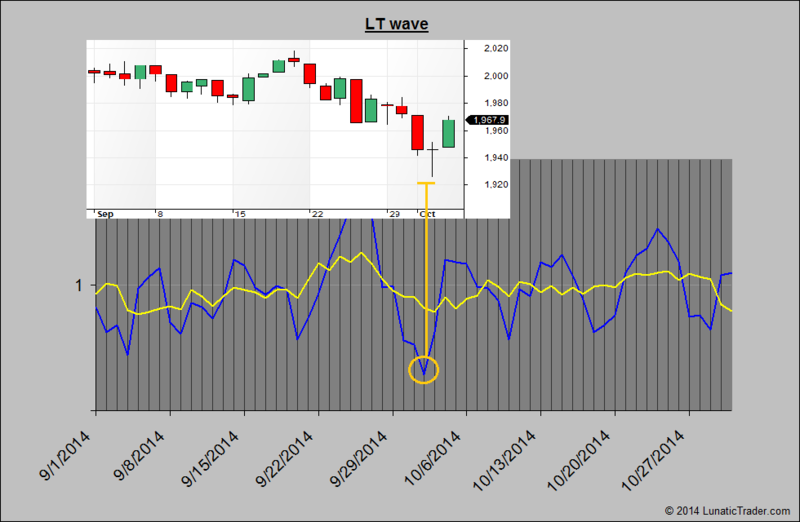 October 2nd happens to be a major bottom value in the LT wave for October. Other expected lows for October are seen on the 10th, 18th and 29th. 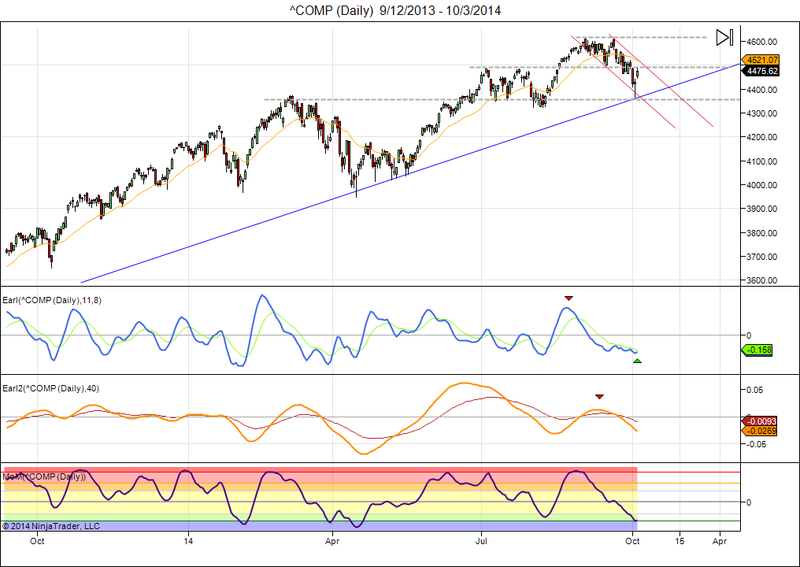 This can be lower lows, or just pullbacks in a rising or sideways market. The projection looks fairly neutral with the strongest period coming in the second half of the month. Remember, this LT wave is experimental, so use with the necessary caution. This entry was posted on October 6, 2014 at 6:25 am	and is filed under Financial Astrology, Market Commentary. Tagged: lunar cycles. You can follow any responses to this entry through the RSS 2.0 feed. You can leave a response, or trackback from your own site. I would like to know more on what the blue line is about. Welcome. See LT wave article linked in left side menu for more info. If lunar cycle is not the only ingredient, is this cycle determined based on any index in U.S.? The LT wave doesn’t take any input from the market itself. That’s why it can be calculated months and even years into the future. In next version of LunaticTrader program the LT wave will be available for the next 100 years. But, as you will understand, I cannot tell what the “secret sauce” is. The main question is what market should be applied LT wave analysis, since currency, index, commodities moves differently, if LT wave forecasts that market is going up next week, at least I need to know which market is expected to go up based on LT wave analysis. It is used for stock markets, not for commodities or currencies. As you see I hold it against the S&P500 in the article. Most world stock markets have a fairly strong correlation, so you can use it for European and Asian markets as well. It is interesting on how Moon effects on stock markets, but I don’t know why most stock markets have a fairly strong correlation within moon instead of currency or commodities, those products are still trading on exchange market, would people prefer trading stock than currency or commodities in this world? so stock market has a stronger correlated link between moon and human based on human’s preference. That’s not what I am saying. This LT wave is for stocks. Stock markets around the world have a high correlation with each other, so this LT wave also works for European and Asian stocks most of the time. There is an LT wave for Bonds and Gold too, but they are very different from this one. If the LT wave doesn’t take any input from the market itself, it should be only one LT wave, but you show that there is an LT wave for Bonds and Gold too, but they are very different from this one. Could you please explain little bit more about LT wave? why are they different with only one single moon? More info will be given when the LT wave gets included in the software.